I’d wanted to do an Azores road trip for years. I have a thing for rugged and wild islands, the kind that you feel you could have been shipwrecked on centuries ago. And smack dab in the middle of the Atlantic 1,400 kilometers from the nearest continent, the Azores certainly fit that description. Though, to be fair, these islands are so beautiful you certainly wouldn’t mind being shipwrecked there. 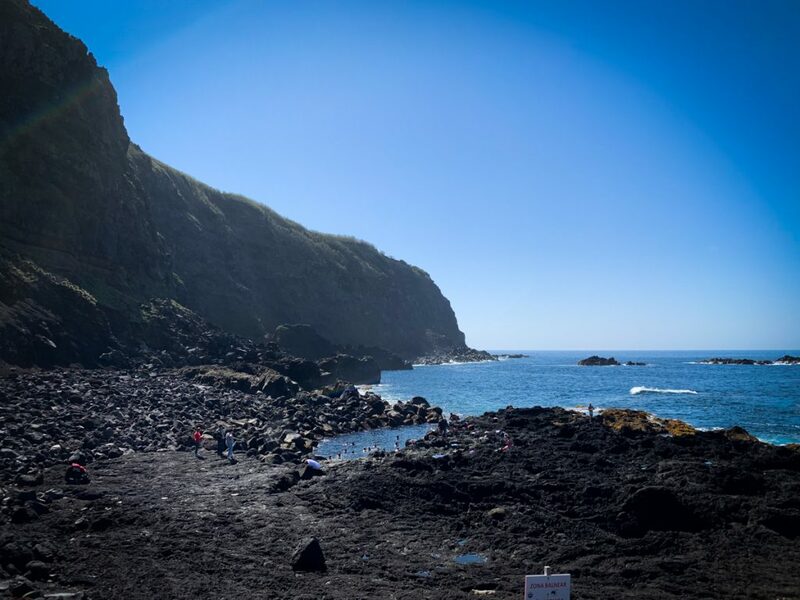 Created by volcanoes a mere 15,000 years ago – a blink in the geological timeline – traveling the Azores is unlike anywhere else I can think of. It’s most often compared to the Hawaii of Europe. But lacking Hawaii’s massive resorts, body slam of tourism, and huge price inflation (seriously, the Azores are about as affordable as Lisbon, which is to say they’re not expensive at all), I find this comparison doesn’t do the Azores justice. My friend and I had a limited amount of time to travel the Azores, so we focused only on Sao Miguel. Luckily, even though it’s the largest island in the archipelago, it’s still rather small. Driving from Ponta Delgada on one side to the other of Sao Miguel (past Nordeste) took one hour. We had 3 days in Sao Miguel and found it to be a great introduction to the islands but wished we had a little more time for our Azores itinerary. However, one of my methods when traveling is to often leave a stone unturned – just to ensure I return to that destination. And having missed one of the Azores’ best tourist attractions due to weather (more on that below), I’m doubly certain the Azores will get a return visit from me. Want to save this itinerary for later? Click to Pin it! Don’t discount the weather. The Azores are an island chain in the middle of the Atlantic, so storms, intense fog, and unpredictable rain storms are not uncommon. In fact, we had to shuffle around our Azores itinerary quite a bit and double back to a few destinations simply because the weather wouldn’t cooperate. Plan your most desired destinations first, so you can return if the weather doesn’t cooperate. Here is where we slipped up. 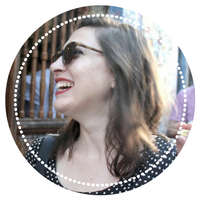 We planned my most anticipated places – Lagoa de Fogo and Caldeira Velha – for our final day. We made it halfway up the mountain where the Miradouro do Pico da Barrosa offers the most incredible view over the Azores’ most famous lake. Then we hit what felt like a white brick wall of fog, promptly both got insanely nervous driving in zero visibility, and turned straight around and retreated to sunny lower grounds. Lagoa de Fogo is notoriously fussy. While Fogo literally means fire in Portuguese and refers to its volcanic origins, the ‘fog’ in its name would be just as accurate of a descriptor. The specific microclimate of this region often means that a dense fog cloud sits on top of Pico da Barrosa like a tight-fitting hat, which means that it’s not only terrifying to drive but also often just plain pointless, as you won’t be able to see anything from the miradouro. 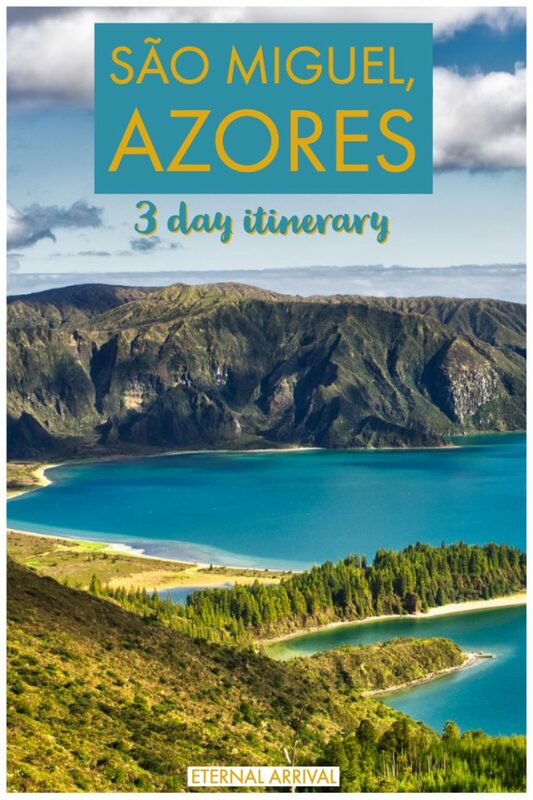 While I did Lagoa de Fogo on my third and final day, I recommend doing it the first (and this Azores itinerary will reflect that) so that if the weather doesn’t cooperate, you can try to return on a later date. This Sao Miguel itinerary assumes that you have your own rental car. However, I know that not everyone can drive or feels comfortable driving abroad, so I will always list a guided tour option when available so that this itinerary is more accessible to everyone. No car? 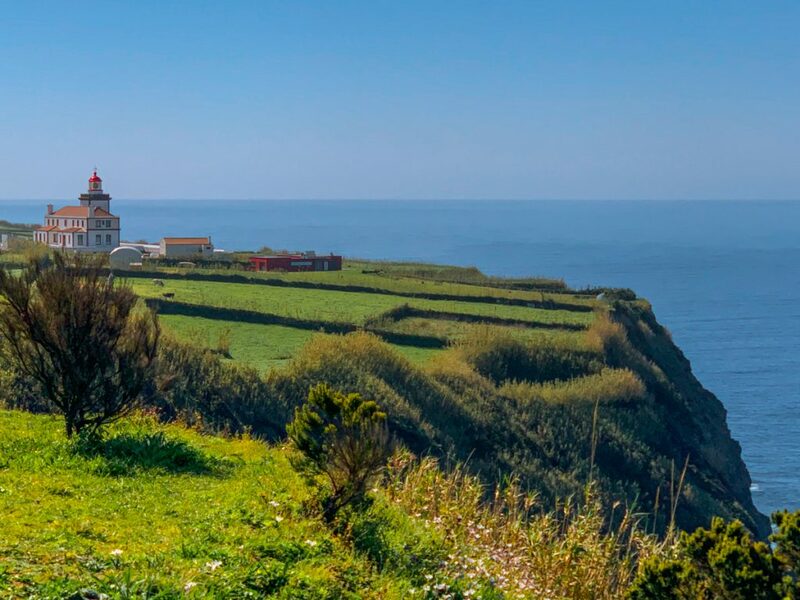 Combine this East Sao Miguel day trip as well as this West tour to cover nearly all the sights on this itinerary. This Azores itinerary also assumes you’ll be staying in Ponta Delgada. However, the island is quite small, so it isn’t too much of a change if you are staying somewhere else, just note that the driving times to the first and last destination may be different if you are staying elsewhere. Keep in mind my advice about the fog: Lagoa de Fogo is notoriously finicky and there will likely be fog obscuring your view. Therefore, I’ve recommended an alternate day 1 itinerary (what I ended up doing after we got too afraid to drive in the heavy fog) as well, in case you end up unlucky with the weather as we did. 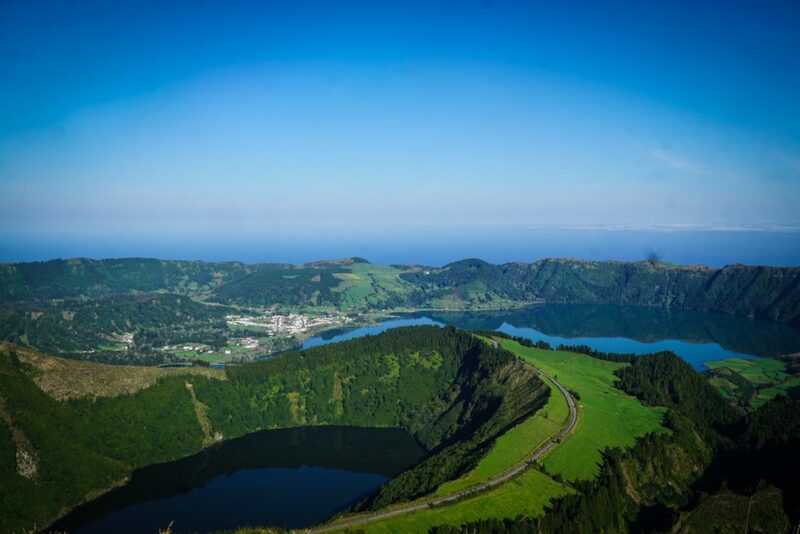 If you have good weather, I recommend visiting Lagoa de Fogo and its two best viewpoints – Miradouro do Pico da Barrosa and Miradouro da Lagoa do Fogo – first, before heading to Caldeira Velha for a soak in the hot springs. 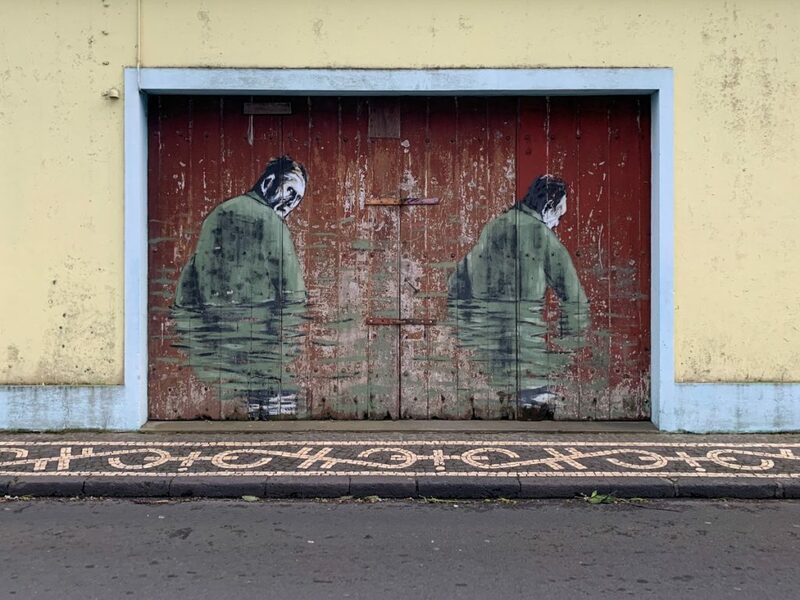 Then head back to Ponta Delgada, making a stop at the pineapple plantation on the way back, to enjoy the city’s unique architecture and funky street art. Alternately, if Lagoa de Fogo is too fussy, I’ve also included what we did instead (it helps to have a backup plan in a place with weather so dramatic!) in the below section so that you can adjust on the fly. One of the most picturesque places in Sao Miguel, the Lagoa de Fogo is the typical postcard photo you probably have in mind when thinking of the Azores. Unfortunately, that postcard-perfect view is rare to find, as fog and clouds typically obscure the top and make the winding roads to the viewpoints of Miradouro do Pico da Barrosa and Miradouro da Lagoa do Fogo quite onerous. So I advise you to throw this on the first day of your Azores itinerary so that you can shuffle things around if necessary and return for the perfect view. While I didn’t make it here myself, I’ve read that you can hike down to the lake level in about 45 minutes each way, though to actually hike the perimeter of the lake would take the better part of a full day. Prefer a guided hike? 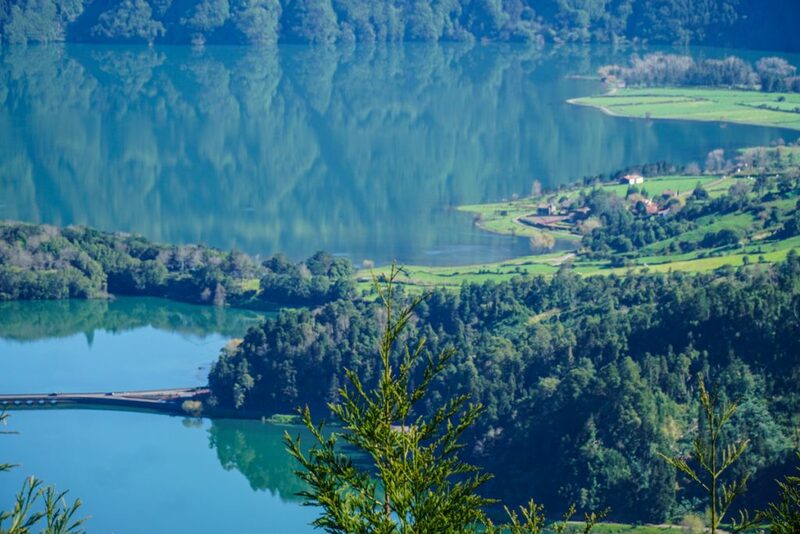 This guided Lagoa do Fogo tour will take you there. On my initial itinerary for the Azores, I had planned for us to head onwards from Lagoa de Fogo to Caldeira Velha. However, the fog kept us from getting to experience this place and that’s truly one of my biggest regrets about our trip to the Azores. When I researched it, this place seemed amazing – geothermic waters in a Jurassic Park-esque setting (minus the whole stressful impending dinosaur attack thing). 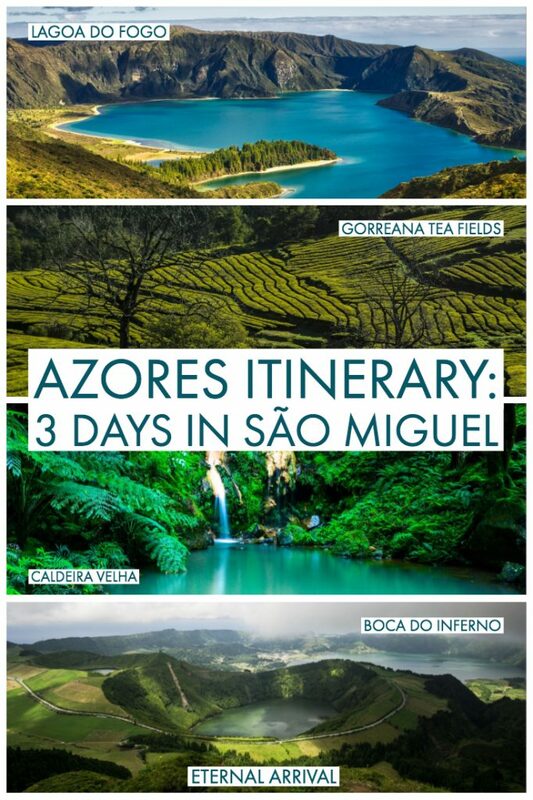 Alas, we didn’t get a chance to visit (though we visited plenty of other hot springs during our time in the Azores that made up for it), but I’m still putting it on this Azores itinerary as I’ve heard nothing but great things about it and was gutted to miss it. A quick note: the water will stain your bathing suit rust-orange, just like the waters at Terra Nostra, so be sure to bring a dark-colored bathing suit or a suit you plan on throwing out after your trip. 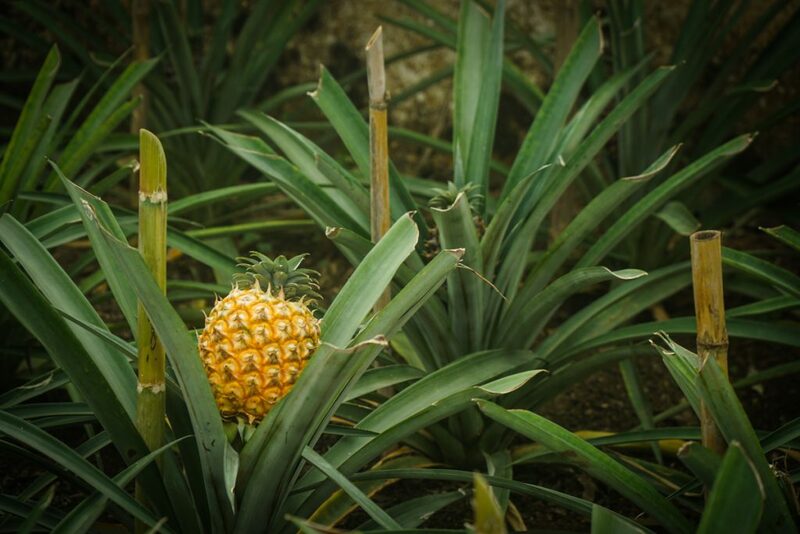 Another image you’ve likely seen from the Azores are the insufferably cute tiny pineapples that are grown there. The only places where pineapples grow in Europe, Ananases A Arruda is a can’t-miss just a short drive from Ponta Delgada. You can walk through a few greenhouses spotting Azorean pineapples in different sizes and phases of growth (they take two years to fully mature). Pineapples are not native to the Azores but were imported from Africa in the 19th century. The pineapple farmers bred their pineapples a bit differently than the standard, creating a smaller fruit with a tinier crown and a more robust, sweet pineapple flavor. Ananases A Arruda is free to visit, but just try to leave without bringing home some pineapple jam or pineapple liqueur that they sell there! This first day of your Azores itinerary is a little light on things to do compared to the other two days, because I think it’s important to dedicate sufficient time to explore beautiful Ponta Delgada. Depending on where you’re traveling from as well or what time you’re getting in, you may be tired as well from traveling, so this day is purposefully lighter than the others as a result. 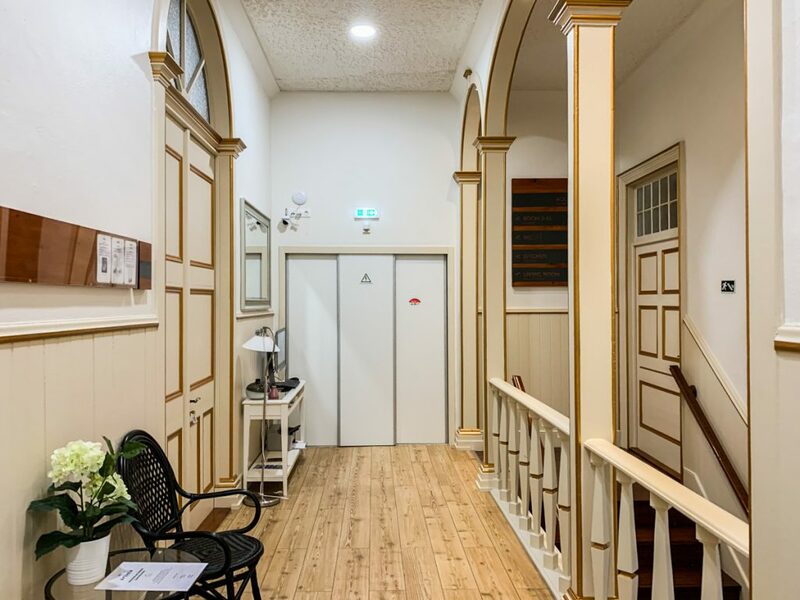 Of course, if you are not staying in Ponta Delgada but rather somewhere else on the island, I’d explore Ponta Delgada first (since you will be flying into the airport and driving past it) so that afterwards you can head to your hotel elsewhere. 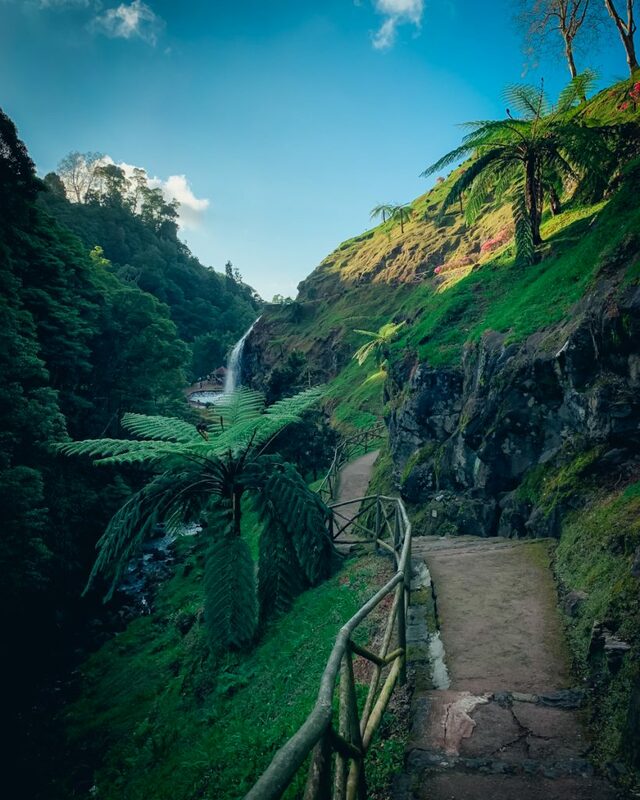 I’ll have a full post on what to visit when you go to Ponta Delgada soon, but for now, I recommend checking out the iconic Pontas de Cidade arch gate, Forte de Sao Bras, and my personal favorite, Jardim António Borges which is full of rare plants and transports you to a Jungle-Book-like world without ever leaving the city center. Have extra time in Ponta Delgada? Join a whale watching tour or swim with wild dolphins. Be sure to book in advance as these tours can be quite popular! Our plan for the day we visited Lagoa de got foiled because of the terrible weather so we made a few adjustments. Instead of going to Lagoa de Fogo, we instead headed to Caloura for a seaside lunch at Bar Caloura, which was fantastic. There is a natural swimming pool in the middle of the ocean here which seems to be free to use. However, considering that mid-March is a pretty god awful time to soak in the middle of the Atlantic, we didn’t test it out. 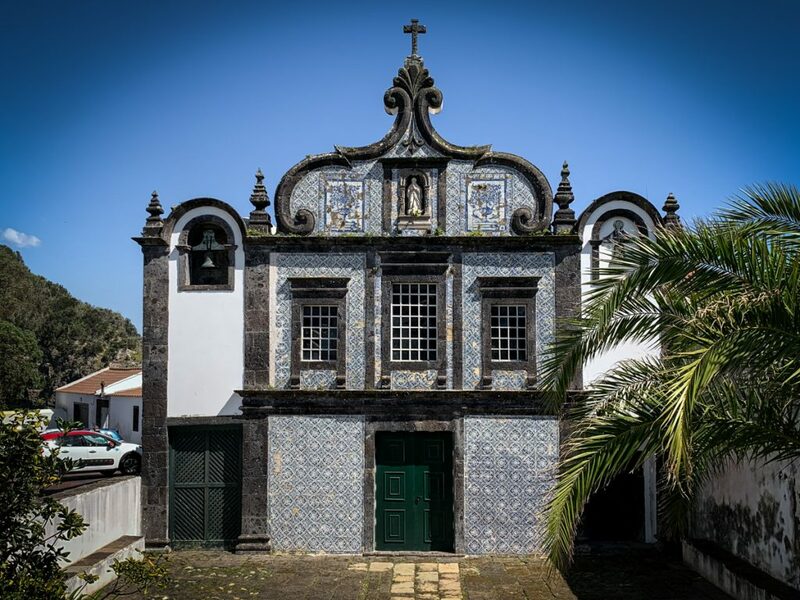 On the drive down to Bar Caloura, about 200 meters before the restaurant, you can’t miss the beautiful Caloura Convent with its traditional azulejo facade. It’s a stunning work of symmetry and tilework and definitely worth a quick photo stop (in fact, I recommend parking here instead of Bar Caloura). Afterwards, we headed towards Praia Pequena de Água d’Alto, stopping at Miradouro do Pisão for a lovely viewpoint over Caloura on the way. 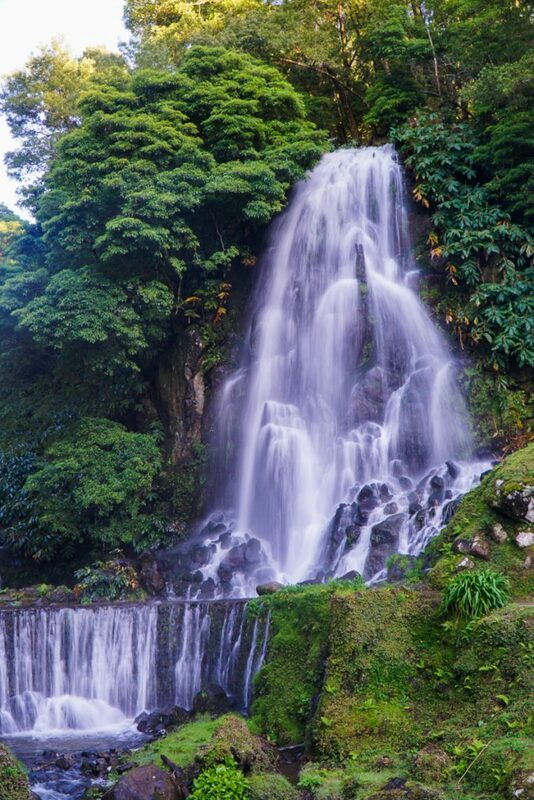 This day is all about lakes, hot springs, waterfalls, and miradouros – pretty much all the things the Azores does best. A few things to keep in mind… fog, again, may be your enemy when it comes to the first two miradouros on this itinerary. You may need to double back or visit another day if there is fog or bad weather when you visit (we had to). However, the fog in this area is definitely less bad than in Lagoa de Fogo. Here, you’ll probably only encounter fog if there is an actual storm as there was when we visited. Meanwhile, at Lagoa de Fogo, the fog sat stubbornly all day – when we drove back past it several hours after we re-routed and changed up our day’s itinerary, the same lid of impenetrable fog was still perched exactly where we saw it. Finally, one last note about day two: you’ll need to check the tide forecast (click here to see it) and use that to plan when to visit Ferraria, as it’s best visited just before or just after low tide. The reason for this is that it’s a geothermically heated pool that mixes with ocean water, and you have to get the balance of thermal water and ocean water just right to get that perfect, surreal, floating in a bathtub while feeling the ocean current vibe. We visited about 30 minutes after low tide and stayed for one hour and it was perfect, but the tide was already starting to come in stronger and if we had come much later it wouldn’t have been nearly as enjoyable. 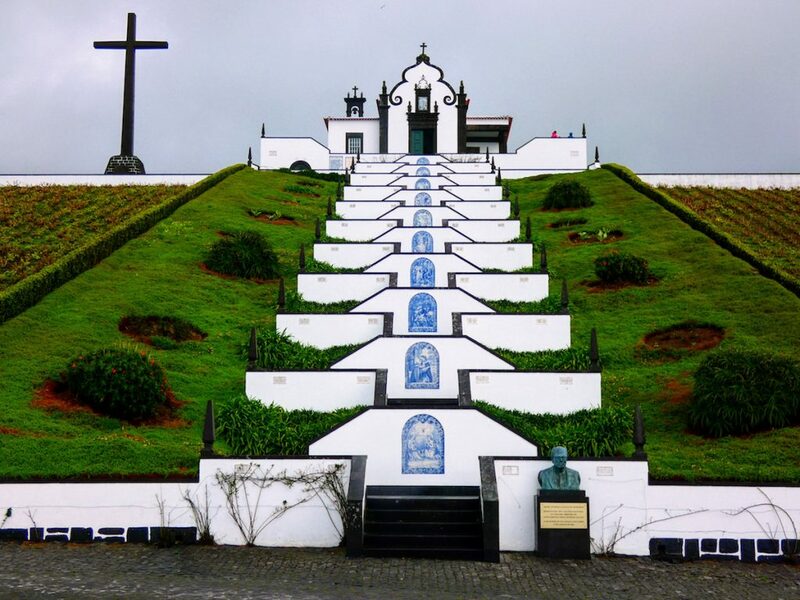 While the nearby Miradouro da Vista do Rei is more popular for some reason, this was actually one of my favorite miradouros on all of Sao Miguel (which, trust me, is a hard distinction to make – there are so many beautiful ones). We parked in the nearby parking lot on the right rather than driving all the way to the miradouro, but we definitely could have driven it as the road was not as bumpy as I was worried about. Still, it’s less than a 1-kilometer walk and it lets you make a quick stop at one of my other favorite places, Lagoa do Canario, on the way to or from the miradouro. The walk up to the best point of the miradouro from the end of the drivable road takes about 10 minutes (~20 minutes if walking from the main parking lot). There is some information there detailing how the landscape was formed – which is super interesting if you’re a geology nerd like I am. Just quick 5-minute detour on the path to or from Miradouro da Boca do Inferno, this lake should be more crowded but thankfully isn’t and it remains one of the most peaceful places on the island despite being so close to some of the most popular tourist spots. 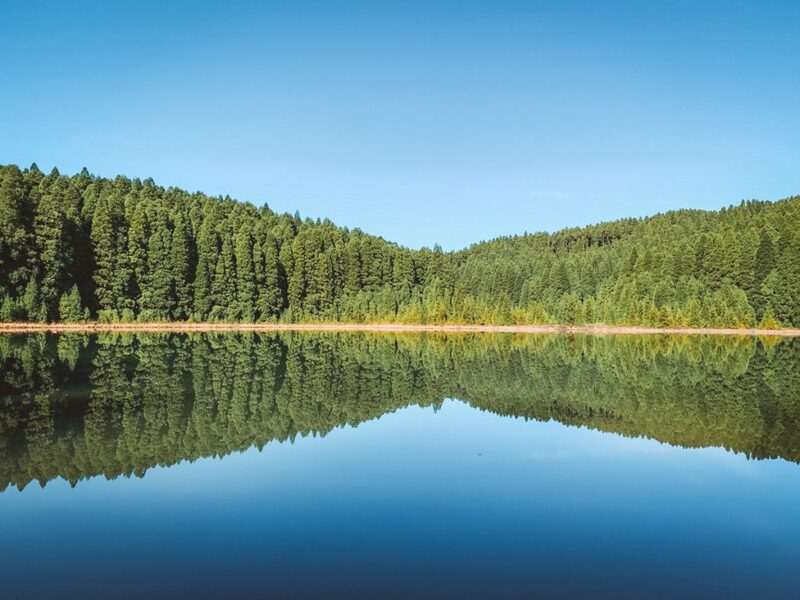 When I visited the lake was perfectly still, sheltered by all the beautiful trees around it, making a gorgeous mirror image. I don’t know why more tourists don’t stop here, but I’m sure glad about it! This was one of the most crowded places I visited on my Azores itinerary so don’t expect peace and quiet here! Personally I much preferred the Miradouro da Boca do Inferno, but since this one is so close, I still recommend visiting both. This is also where you’ll find the so-called ‘abandoned hotel’, Hotel Monte Palace. 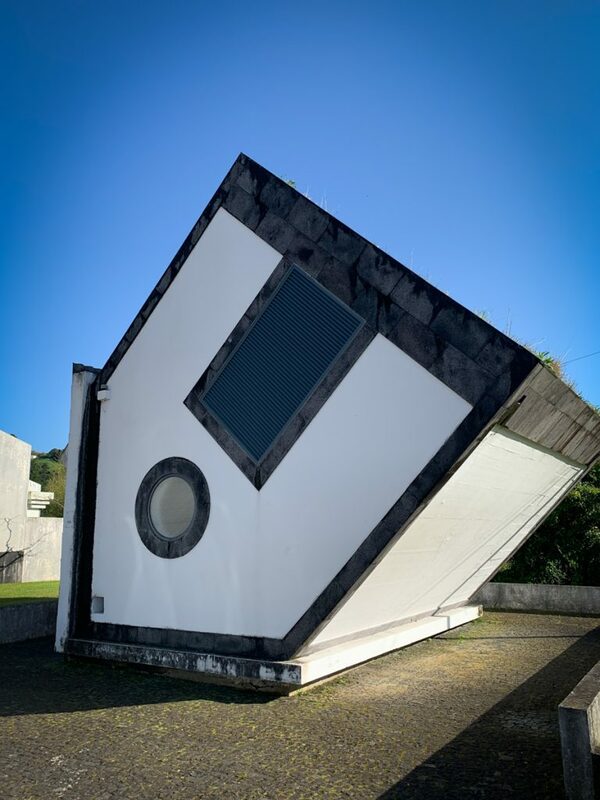 Though to be honest, it’s barely abandoned at all… considering that it’s at the doorstep of one of the most visited tourist attractions in the Azores and people are constantly there. Some people go inside despite the signs telling you not to enter. I personally don’t advise entering, especially since there are plans to reopen it in 2021, and I would imagine the new developers don’t take kindly to trespassers. Heading down from the mountain views, the town of Sete Cidades is definitely well worth a stop (and perhaps a quick lunch break – I ate at a small cantina near the church). It’s worth it to make a stop after you’ve crossed the bridge dividing the lake in two to stop and take photos from eye level, which has a much different visual than from above. 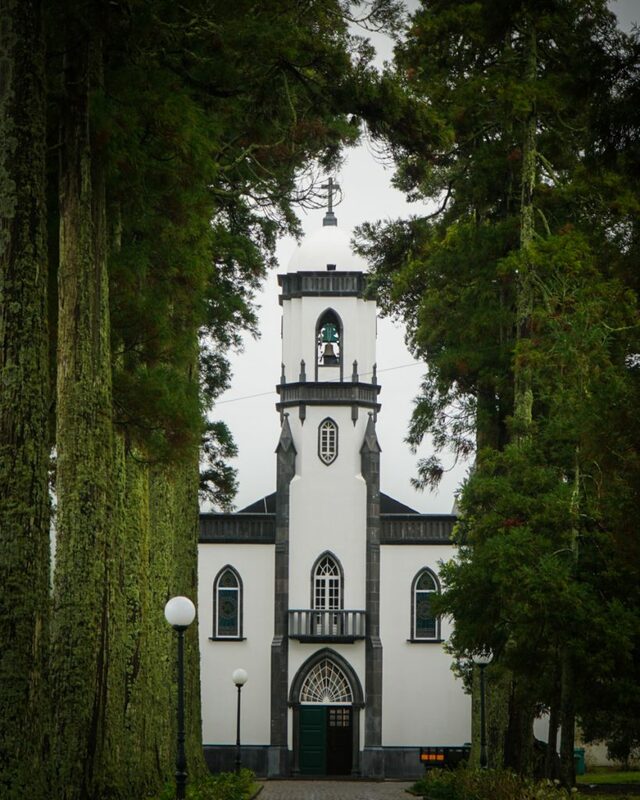 I also loved visiting the church in Sete Cidades, with its ghoulishly beautiful row of trees framing it like something out of a movie. If you prefer someone else to drive, this 4WD Sete Cidades trip is an adrenaline-pumping experience! This was truly my favorite thing I did in the Azores and absolutely a can’t-miss, in my opinion. 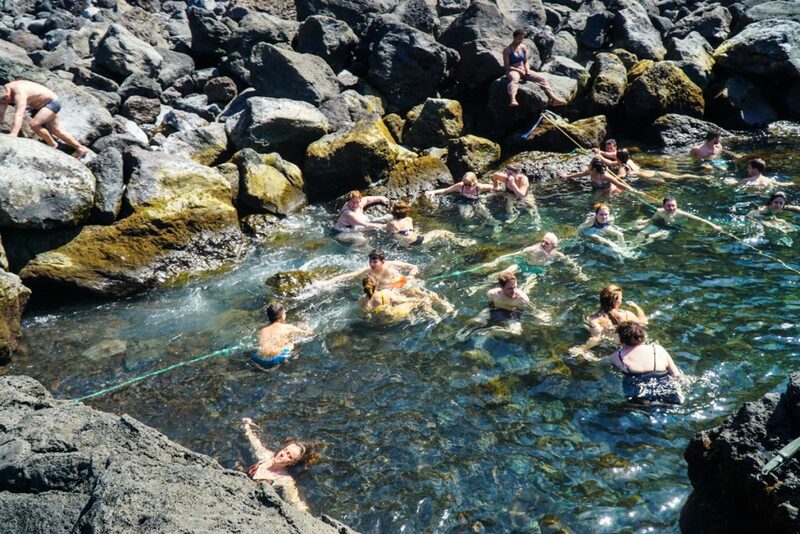 Here is where geothermically heated waters from the ground mix with the cold, brisk waters of the Atlantic, combining to lukewarm perfection in a natural pool formed by rocks. While in many other places in the world, they’d alter the hell out of the landscape, the approach in the Azores is thankfully rather minimalist – I mean, why mess with perfection? All they’ve added is a ladder and some ropes for safety. The rest is all as the earth intended it to be (there are some bathrooms and changing rooms nearby, though). Sitting in the waters, feeling the geothermal hot springs sweep past me on one ebb of the tide and the cold Atlantic waters rush past me on another, was truly my favorite experience of my entire Azores trip. I must have sat there for at least an hour murmuring “this is magical” over and over again. Something about the combination of the hot and cold waters and the peaceful yet powerful feeling of the ocean water repeatedly flowing in and out was truly spectacular. Note that it is rather popular and there is a limited time period in the day where you can experience Ferraria at its best. Come exactly at low tide and the water will be too hot in some places, come too close to high tide and the water won’t be warm at all because it’ll be too diluted by ocean water (plus it seems like it would be dangerous at high tide, judging by where the water line was). I visited about 30 minutes after low tide passed (check out the tide forecast here) and it was perfect. I stayed for about an hour and noticed the water level rising and the general water level getting cooler by the time I was ready to leave. I visited around 10:30 AM and it was quite crowded with people who also had the same idea but still very, very enjoyable. However, keep in mind that the tides vary day to day so be sure to plan your itinerary around this and shuffle things around if needed to come at the optimal time. There’s also a lighthouse in town that you can visit, but we just checked it out from the nearby miradouro, halfway between the town and the thermal pools. 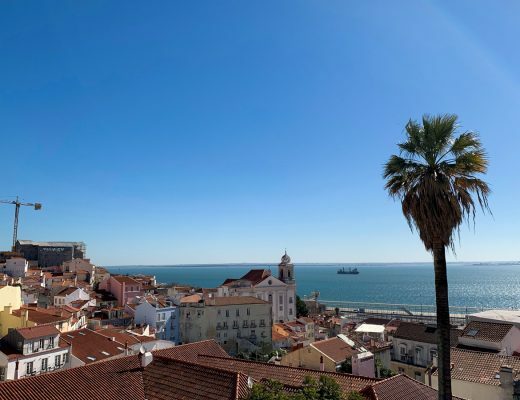 This rarely-visited miradouro on the way to Mosteiro is absolutely worth a quick stop because it’s absolutely breathtaking. You won’t need much time here, maybe 10 minutes or so, but I couldn’t leave it off this Azores itinerary! 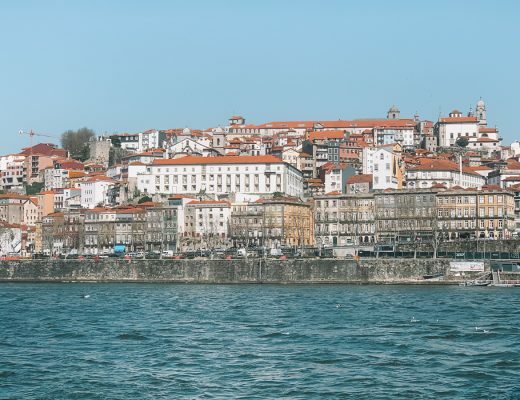 You’ll get views over the black sands of Mosteiro and the stunning sea stacks off the coast. This small town is known for its black sand beach and beautiful sea stacks. There are also some small natural pools that form due to the rock formations and the tide. However, when we visited the weather was extremely windy and the tide was churning strongly, so it didn’t look safe to enter the water. However, I’ve seen photos of it at other times and people are swimming and enjoying the water, so it’ll depend on the weather as well as the tide. It was too cold in March to even think about getting in, so consider your time as well, because this is just straight up ocean water and not geothermally-warmed waters mixing with ocean water in like Ferraria. 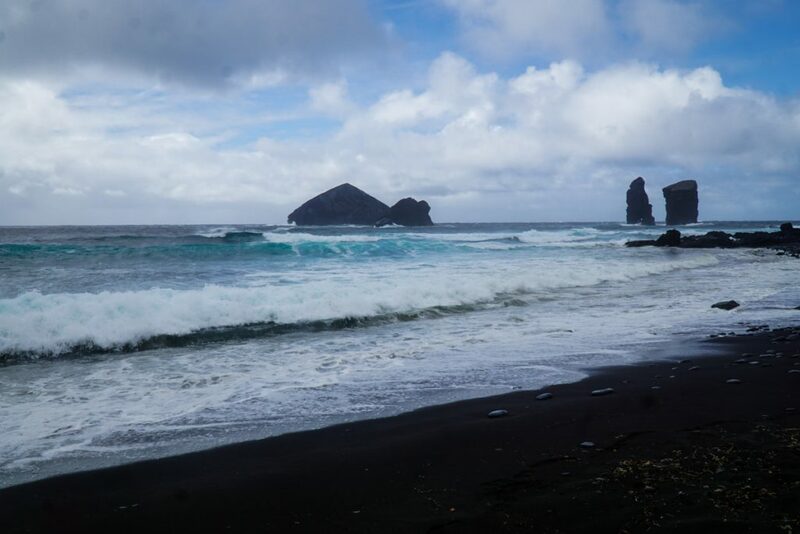 The black sand beach with its view of the sea stacks and the natural pools are located in different parts of town so you’ll likely prefer to drive between the two as they are a little far apart. The only tea plantation in Europe, Gorreana Tea Factory is a wonderful stop on any Azores itinerary, located on the north coast of Sao Miguel. Normally, the European climate is too harsh for tea to truly prosper, but the unique Azorean climate is different. 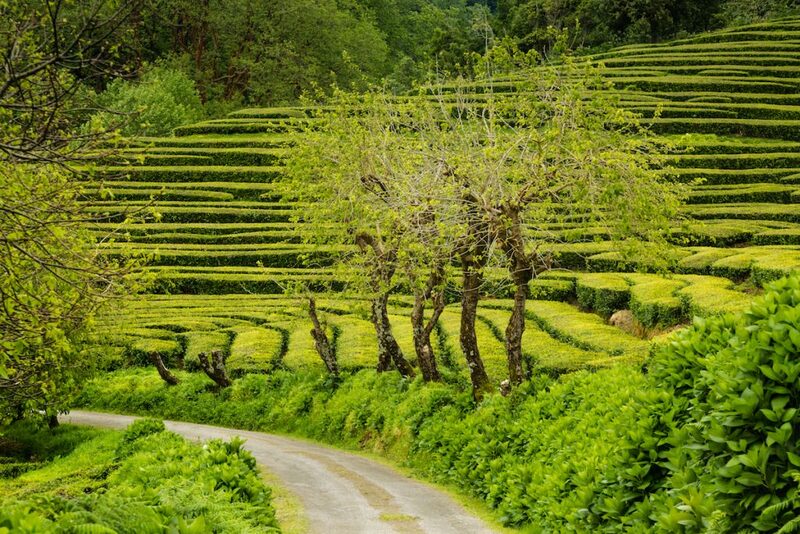 The first plantation was created by the Azorean Jacinto Leite in the 1820s, who imported tea seeds from Rio de Janeiro while he was stationed there. The crops grew in importance when the trade in oranges declined (around the same time as pineapples began to be cultivated in the Azores as well), as agriculture has always been a crucial part of the Azorean economy. The plantation you can visit today is Gorreana Tea Factory. It was founded in 1883, after hiring some Chinese tea experts to consult on how to improve their tea plantation. The Gorreana Tea Factory has 32 acres you can visit and you can visit some of the machines they use to dry, process, and produce the tea leaves. You can do a hike in the area or just simply walk around the tea fields for a bit, depending on the weather. Or you can simply enjoy a free (yes, free!) cup of tea inside the factory! While to be fair, I know very little about tea, I started every morning in the Azores with a cup of Gorreana green tea and found it truly exquisite – never would I imagine that this was tea grown on a misty, moody island in the middle of the Atlantic! 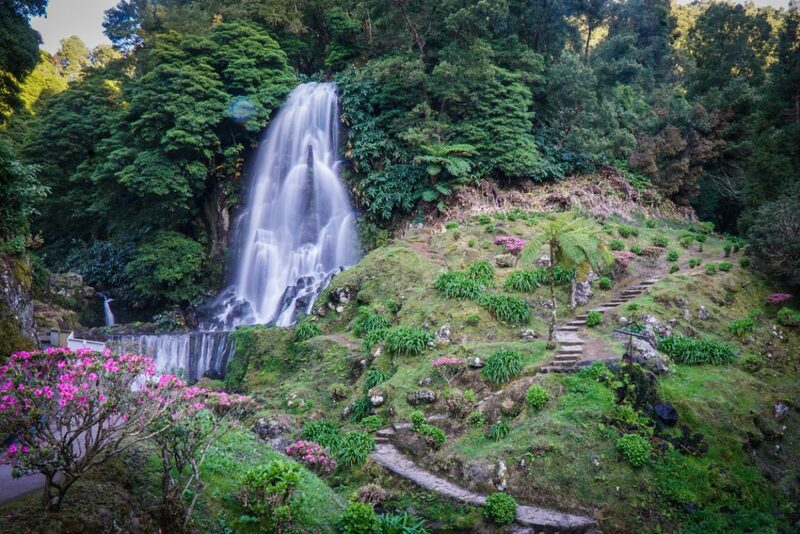 One of the biggest surprises of my trips to the Azores was this small natural park filled with beautiful views, flowers, and flowing waterfalls. It’s smaller than I expected but it was packed with so much beauty that I hardly minded – especially because my visit coincided perfectly with golden hour. There is one waterfall inside the ‘park’ proper, but don’t miss the larger waterfall just a little ways up the road which is even more impressive and beautiful. If you want to go here without a car, join this Nordeste day trip as neither the West or East Sao Miguel tours cover this or the Miradouro da Ponta do Sossego below. 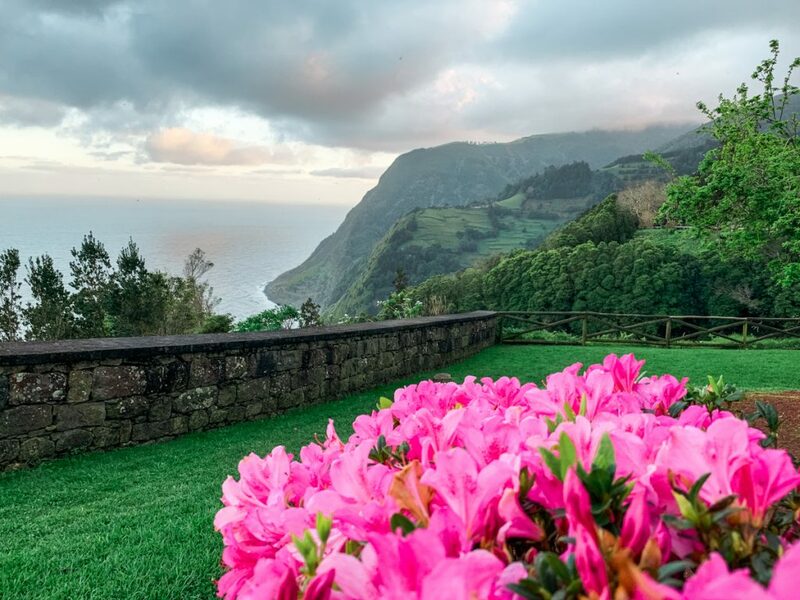 Sossego means ‘calmness’ in Portuguese and that’s exactly what you’ll find here in this picturesque miradouro just past Nordeste, pretty much as far as you can drive from Ponta Delgada without plunging into the Atlantic Ocean. 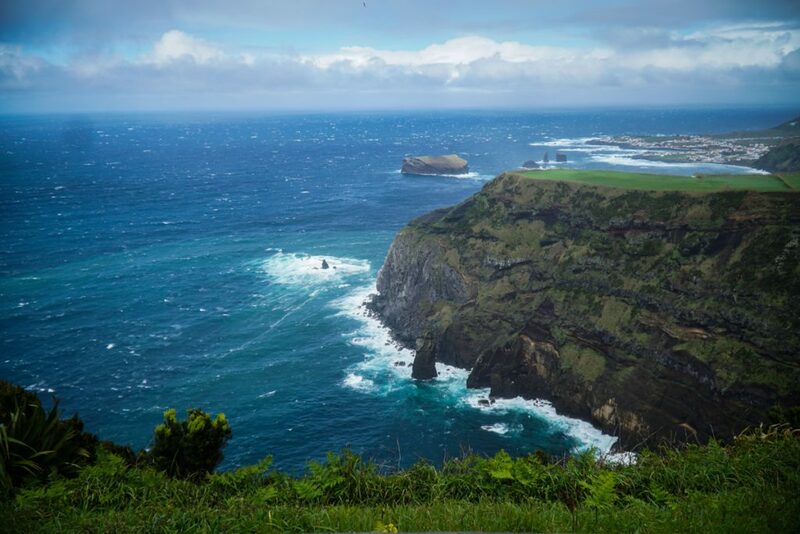 This was one of the most spectacular places on my Azores itinerary and while it is quite far from Ponta Delgada and does make for a long drive back at the end of the day, I can promise you that it will be worth it. The views of the cliffs are incredible. Just a little ways further is the Miradouro da Ponta da Madrugada, which also offers incredible views and is worth driving a little further to if your time permits, but personally I loved Ponta do Sossego and found it to be the most beautiful place I visited on all of Sao Miguel. One of the most Instagrammed places in the Azores, my foolish self didn’t realize that this place was actually in Sao Miguel (for some reason I thought it was in Terceira!) and failed to actually go here… Whoops. As I like to say, being a travel blogger is basically just being a professional mistake-maker so that our readers can have a more seamless experience than we do! 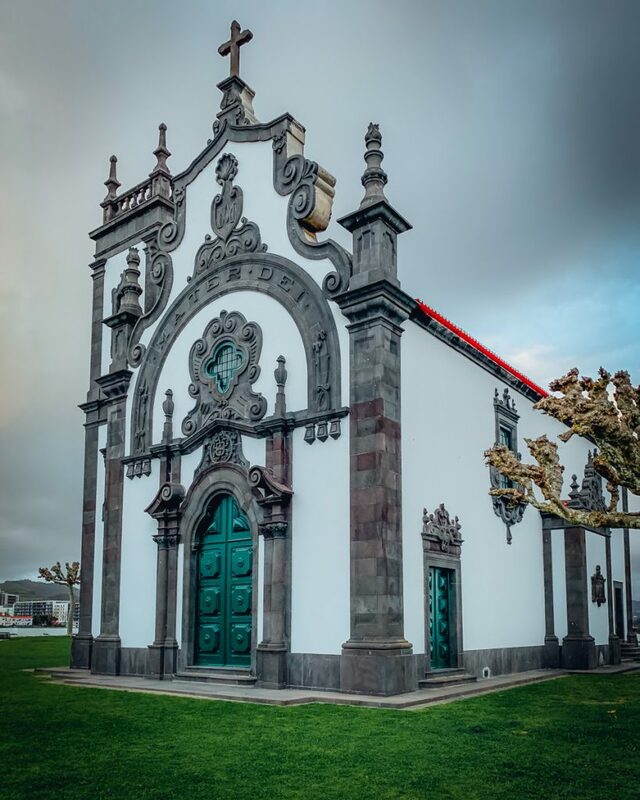 When creating the maps for this Azores itinerary I realized that I was literally in the town where this famous chapel is… and left without seeing its most famous attraction. I had been at the black sand beach in nearby Alto do Agua and stopped to get gas in Vila Franco de Campo (and tried and failed to see a ‘secret waterfall’ that proved too secret for us to indeed find)… and left before seeing this spot which had been on my Azores bucket list. Whoops. 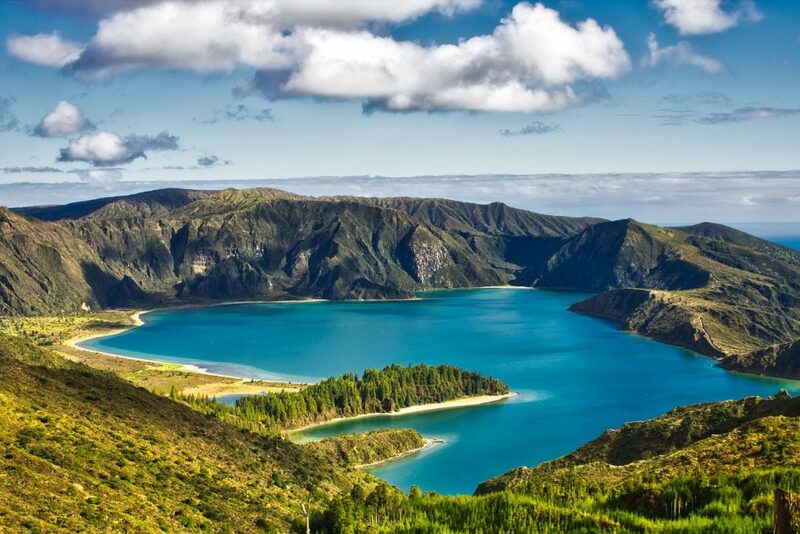 So while I can’t offer any firsthand advice, I can tell you it’s on the way to Lagoa do Congro and would make a great stop on the final day of your 3 day Azores itinerary. A note to all my fellow nervous drivers out there: the road to Lagoa do Congro is a tricky one! It’s quite narrow and really uneven, with places that made it seem like we could easily get our tire stuck in a rut. We ended up parking well before the parking spot at a place where there was enough room for cars to pass us and walking the rest of the way. If you have a taller car (I highly doubt that is the actual technical term, but let’s roll with it), you may feel fine, but I was doubtful. One of the coolest places I visited in the Azores was the abandoned Capela da Nossa Senhora das Vitorias on the perimeter of Furnas Lake. You can’t go inside, but it is hauntingly beautiful to visit and imagine it in its prime. 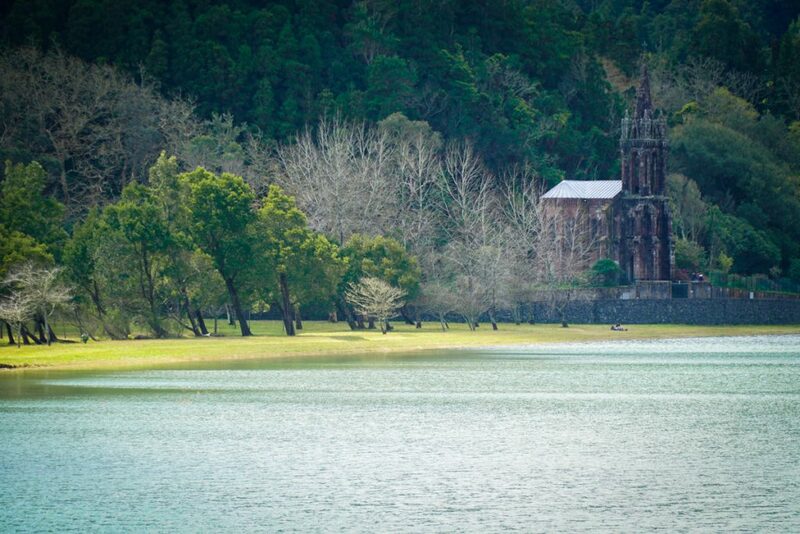 I highly recommend continuing to take a walk around Furnas Lake (it took us about 2 hours going slowly and taking lots of photos) so you can get photos of it from all angles. 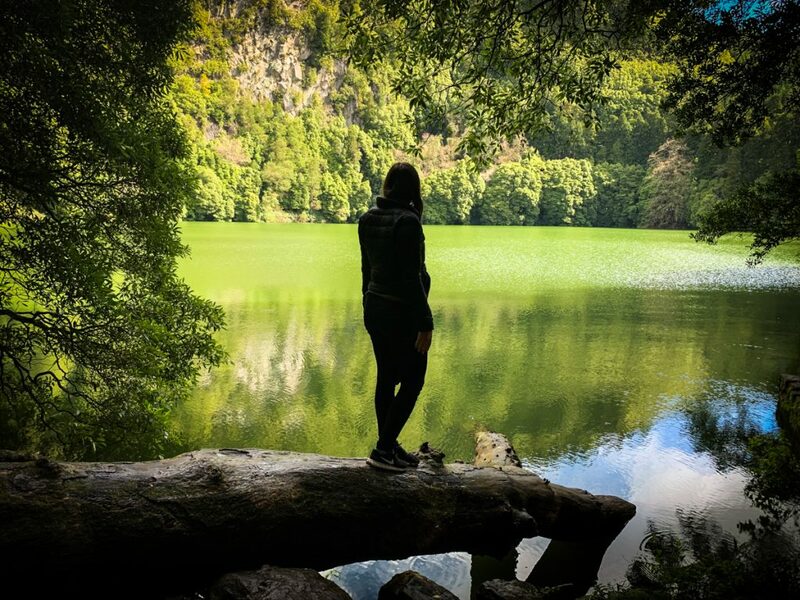 We took the time to walk around Furnas Lake and it was absolutely magical! 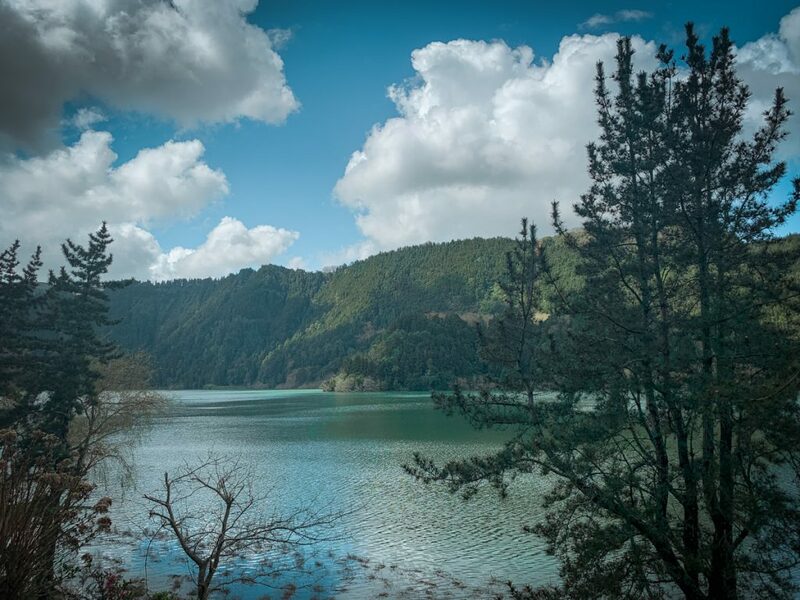 I know with just 3 days in Sao Miguel it can be tempting to hop in the car from photo spot to photo spot, but I was so glad we took the extra time to wander around the entire perimeter of the lake – about 2 hours with stops. The colors of the lake changed dramatically depending on the angle, hour, and distance from the lake, making it a magical experience. It’s also an extremely easy hike – in fact, I don’t even think you could class it as a hike, as it’s pretty much entirely flat. It is basically a long walk along a path for most of the hike and then alongside the road for the final bit (but there is a pedestrian area sheltered from the roadway). 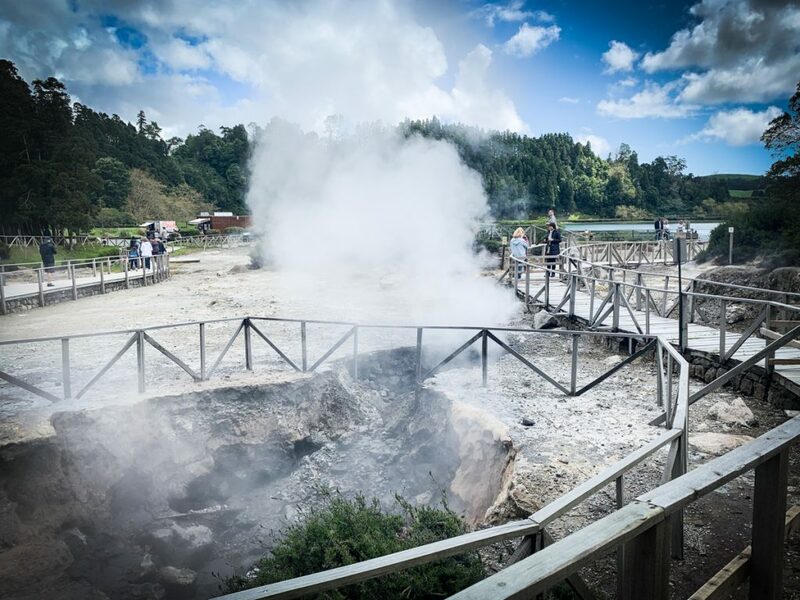 Along the way we stopped at the Furnas Fumaroles which is where we saw a lot of tour buses stopping for lunch of hot steaming cozidos, stews cooked in the geothermic heat of the earth. If you don’t want to walk around the entire lake, you could simply park near the abandoned chapel and visit that separately then come here. There’s a parking lot by the chapel, at quite a reasonable price of 40 cents per hour. If you’ve started researching your Azores trip you’ve undoubtedly come across photos of Terra Nostra and its strange orange-gold waters. 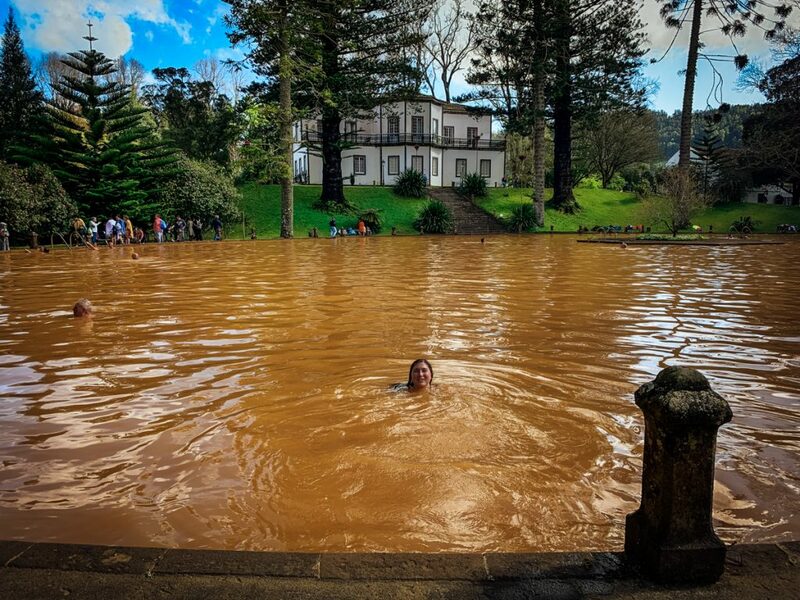 The color comes from the iron-rich volcanic springs beneath it, which pump out hot bathwater-like mineral rich water to enjoy a soak in (especially rewarding after hiking around Lagoa das Furnas!). 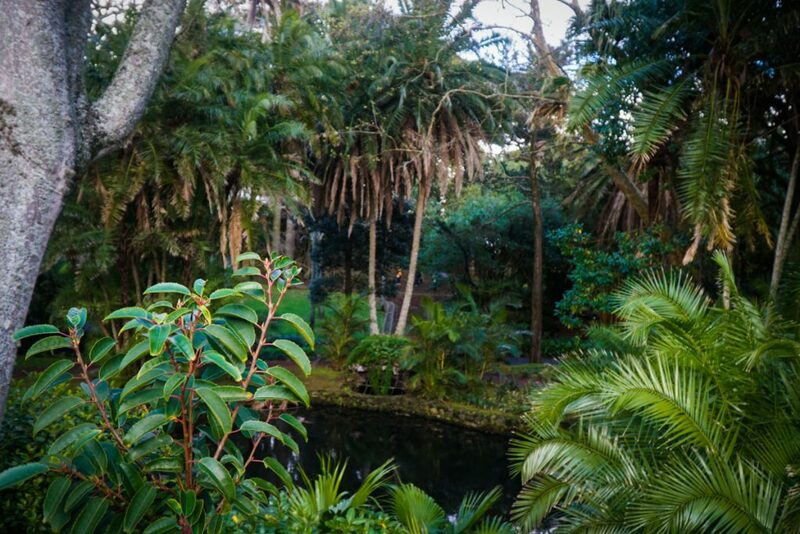 The Terra Nostra Gardens date back to 1780, when it was created by a wealthy American living abroad in the Azores. It was made larger in 1935, and the 35-acre gardens were extended dramatically. While I loved soaking in the giant gold pool, I loved walking through the gardens nearly as much! They are truly spectacular and definitely worth spending some time exploring. You can also eat at the restaurant in Terra Nostra, although we didn’t due to running low on time. I’ve read that if you eat at the restaurant you can get free entry to the grounds but I would recommend calling to confirm. Cozidos, the stews cooked in the earth, are available here, as well as other traditional Portuguese dishes. Don’t miss soaking in the smaller springs near the changing rooms as well, which have warmer, clearer water and are surrounded by lots of plant life. Just remember that like at Caldeira Velha, the iron-rich water will stain your bathing suit, so be sure to bring a black swimsuit or an old one that you don’t care much about! This quirky little stop is in the center of town in Furnas close to the bus station. It’s actually a power station of some kind, but it blends into all the other normal houses on the block which makes it quite a quirky and interesting stop while already in Furnas. 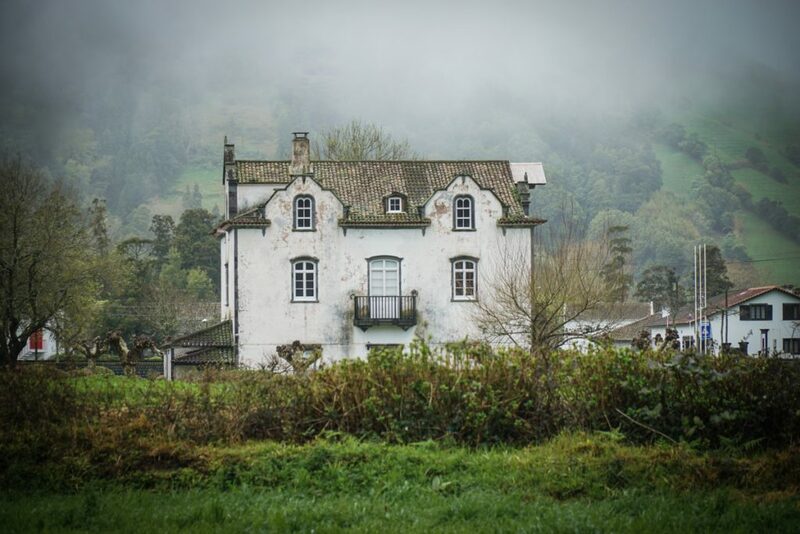 It’s interesting and easy to visit, especially since you’re already in Furnas, but it’s not an essential stop! 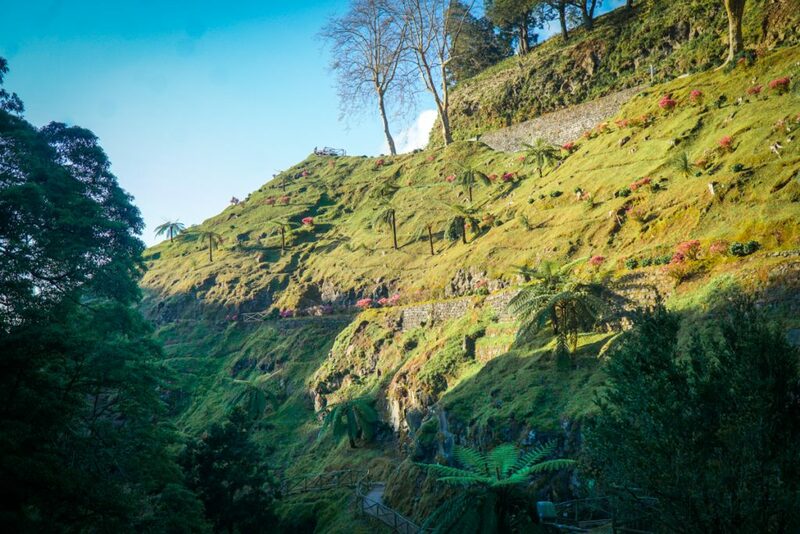 If you want to get in one last dip in the hot springs, add in Poça da Dona Beija! 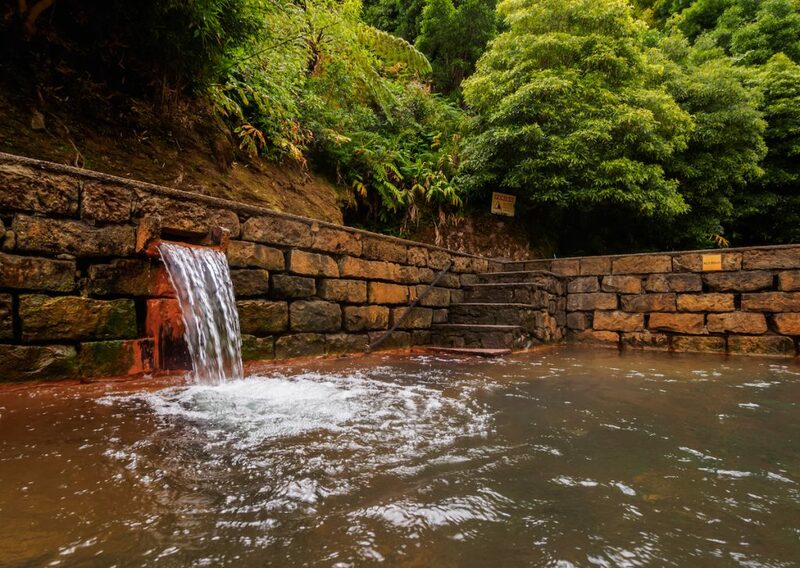 Honestly, after visiting Terra Nostra and soaking in the springs for a few hours, I wasn’t really feeling up to go to another hot spring, but I thought I’d mention it here regardless as it has quite positive reviews! I’ll have a post with more recommendations shortly, but I really loved staying in Ponta Delgada. It had a wide variety of restaurants to choose from and no place on the island is that far from it as it is quite central. The most I ever drove from Ponta Delgada to anywhere was 1 hour and that was the total opposite side of the island. 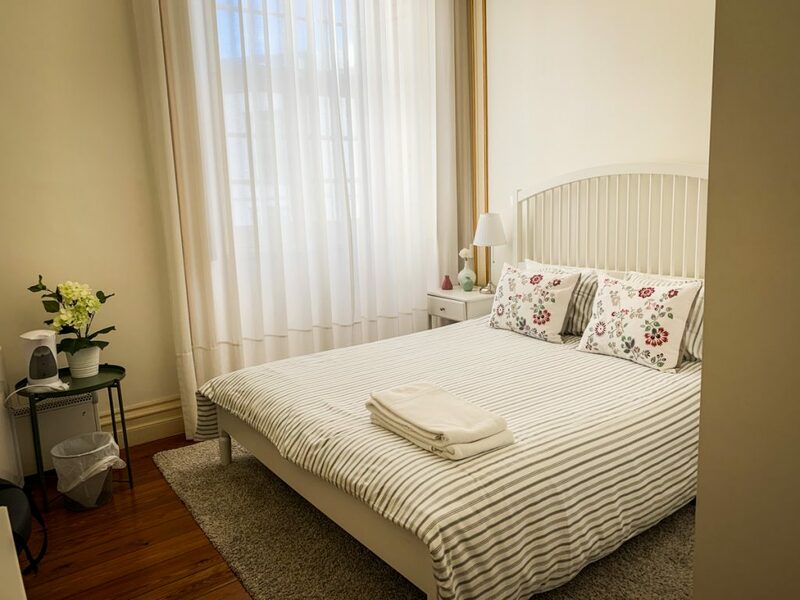 We were traveling on a low to mid-range budget and was so happy to find Casa Ateneu at a reasonable price (check here for current rates and availability). 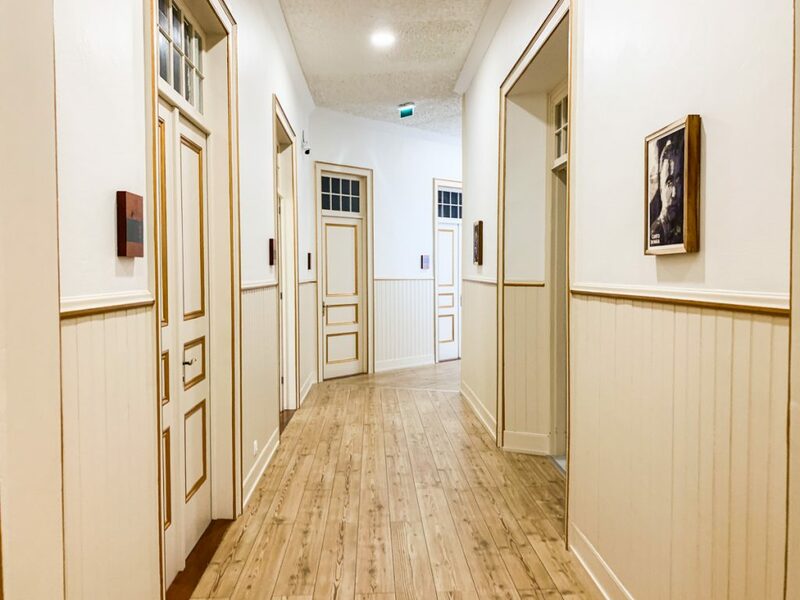 We paid 35 euros per night for a double room with ensuite bathroom and thought it was an amazing value. However, keep in mind we traveled a bit off-season near the end of March, so I would imagine the rooms would cost about twice as much in the summer. The room was not huge but it felt really spacious with insanely high ceilings (seriously… like two stories tall high! ), and lovely, comfortable bedding and plenty of outlets and places to store things. The whole interior of the house had a really lovely, homey vibe to it, and there was a kitchen that was free to use if you wanted to cook for yourself as well. We didn’t use it but it looked quite well-stocked! One thing to note: the reception is not actually located at Casa Ateneu but just down the street from it. That said, check-in was super easy since we could just walk one block away to meet them to get our keys and get a tour of the property. The staff was always available to help us, even walking over with our printed boarding passes one evening, when the computer at Casa Ateneu was having trouble printing. But my favorite part of staying at Casa Ateneu was the picnic baskets full of delicious breakfast goodies they gave us every day in lieu of a standard breakfast buffet. This was perfect as we’d simply make a cup of coffee or Gorreana tea (free in the kitchen) first thing in the morning, head to our first miradouro or viewpoint, and have a picnic breakfast in gorgeous surroundings. They even included coffee and tea in the breakfast baskets, though you’d need a Thermos to hold some super hot water if you were going to make the coffee or tea. 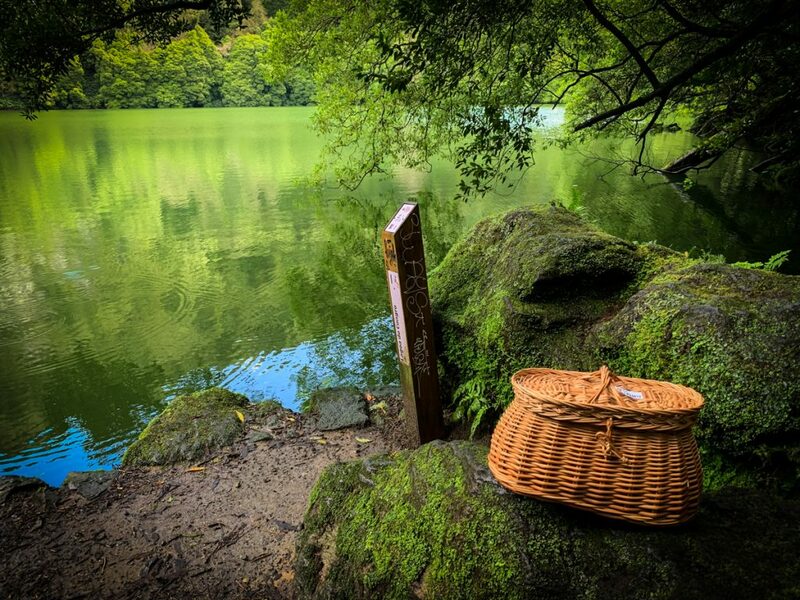 Eating breakfast each morning out of a picnic basket overlooking a lake, surrounded by trees and the hum of birds, was one of the highlights of my Azores trip and I wonder why more hotels don’t do this! Ready to book? 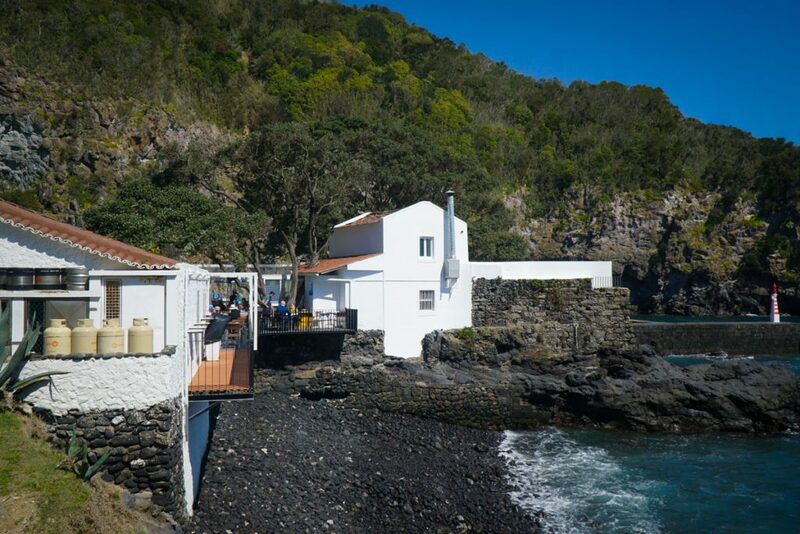 Check out Casa Ateneu or other Sao Miguel hotels here.